(a) Awakening among parents to send their girl-children to schools. (b) Providing books and other writing material for girl students. (c) Running Adult education centres in villages, slums and townships. (d) Forming an educational society in every district to look after the facilities for higher education for the girl-children. acting as a catalyst between the government and women beneficiaries for employment. inviting private institution to provides jobs for women. setting up of technical training centres in every district for training women to run their cottage industries at their homes. helping women to obtain funds from financial institutions for starting their own industry or business. imparting education to women about generating sources of income at home. providing facilities, like raw material, transportation and markests through cooperative societies. since women are the backbone of the culture, they would be made aware of their immense cultural heritage by arranging various cultural programmes at districts and State level with the help of local artists. Providing exposure to the local women talent in various performing arts. conducting women awareness programmes through cultural shows and various demonstrations programmes. Programme for proper nutrition for women and children. Education on child-care and mother care. Providing nutritious food to women and children through Disha's own resources and Government's resources. Proper medical facilities for women. Educational programme to apprise them of their power to generate. 'Raksha' committees would be set up to highlight the cases of atrocities against women and work for justice to the women. Women would be organised to combat atrocities like, manhandlers, dowry, banishment etc. 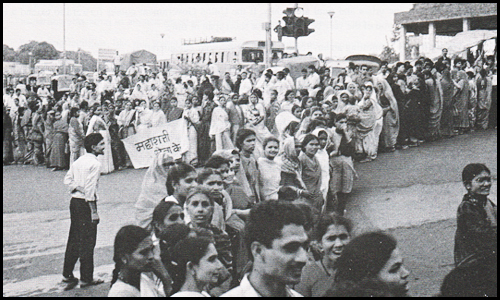 Women would be organised in a manner to emerge as a force against communalism. Communal Harmony programmes for women and preparing them to work for it during crisis. Finally 'Disha' would be a women's movement for making Indian women a far superior model before the world..
Project for bringing awareness among people for preserving the environment, conservation of forests and field work for intensive plantation in urban areas, rural areas and those forest areas which have been either degraded or have become totally bald due to illegal felling of trees and so-called random development projects. Motion is the eternal source of life and is the essence of nature. Its endless extention is the environment which includes all visible and invisible things spread around. Even the lifeless objects have their atoms in motion and make them a part of the nature. Man is undoubtedly superior to all other living creatures and ows a greater responsibility to keep the environment healthier of which he is also a small but important fragment. Nature's endowments are no doubt immense but nature has a time bound process of creation and destruction. So undisciplined and unplanned destruction causes an imbalance to which we know as "Ecological imbalance". This imbalance is a ready made catalyst to aggravate the problems of man. We are a women organisation, working for the upliftment of women. Women is a unit symbol of nature as she is also the creator. We have also taken up some programmes to enrich the nature's endowments with a view to bringing awareness about preservation of environment. But with the limited resources our field is limited to scanty plantation work in some urban and rural areas only. If the Union Government comes forward to extend a little support to us we assure you of the very best results in a short span of time. We are hereby submitting an environment project for your consideration. We intend to start plantation in all the schools and Colleges all over the State through "Environment Guards" Committees of the students. Rich plantation at the degraded forest land. This plantation would be guarded by the "Mahashakti Raksha" Committees of the tribals of the respective areas. These Tribals Committees would guard the plantation in their respective areas and after five years Forest Department would take over the plantation by making them incentive payments for their work. Incentive payment would depend upon the quantum and quality of the trees planted in the area. Our organisation would encourage the farmers, having more than 8 acres of land to provide atleast half acre land for plantation. This land will be handed over to the local administration after 5 years for a substanital cost of trees. We intend to develop such rich nurseries all over the state. 'Maha Shakti Environment Brigade', a part of the organisation would setup a call for monitoring the information about the development projects, impuring the environment, illegal felling of trees, encroachment on forest land. It would send its reports to the State Government and Forest and Environment Ministry of Government of India with its Suggestions. We also intend to institute an award for the best plantation work in the State by tribals. Printing of posters and stickers for bringing awareness among people for preservation of environment and conservation of forests. These will be distributed to mediamen and among tribals in rural and forest areas. Mahashakti Environment' camps would be organised all over the State with the help of local Committees where noted environmentalists would guide the local people and educate them about preservation of environment. Industries violating the environment laws and causing any kind of pollution to the environment would be contacted and a report about those would be sent to the State Government and as well as to the Environment Ministry of the Union Government. We also intend to make a short film on preservation of environment with a theme appealing to the minds of Indian people and which will establish an ethical, social and moral congruency with the social anxiety of the Indian people. We also wish to prepare a detailed draft on the dangers of pollution with suitable positive amendments to the existing Environment laws with respect to the new problems of today endangering the sanctity of nature. man has reached to a position of dielectic conflict with nature and resulting paying the penalty of hampering the physical qualities of environment whereas its chemistry is still intact. Before the time runs out, we hope your goodself would extend us support to give pace to our efforts in this. direction.